Today the Mexican Embassy hosted the opening of the exhibition “Picture This: Our Diverse Reality”, which shares the perspectives of persons with diverse abilities through photographs they have taken about what is important to them. The exhibition is coordinated by Sharon Craig, Kent Young and Sister Beverly Hoffman, in collaboration with the Sisters of Charity of Nazareth, the Belize Assembly for Persons with Diverse Abilities, Care Belize, St. Francis Xavier University of Canada and the Mexican Embassy. In the last years, Mexico has provided special attention to the policies related to persons with diverse abilities both at the domestic and the international level. On September 2001, Mexico proposed to the United Nations to discuss an international convention to protect persons with disabilities at the World Conference against racism in Durban, South Africa. After being approved and ratified by different countries, finally on May 3rd, 2008 the U.N. Convention on the Rights of Persons with Disabilities came into force. Additionally, Mexico has continued participating in different regional and international organizations promoting the protection of persons with diverse abilities. At the domestic level, Mexico established in 2003 the Anti-discrimination Council, lead by Mr. Gilberto Rincon-Gallardo, a national and international leader of persons with disabilities and a political activist in Mexico. Mexico has also enhance the development of different initiatives and public-private projects to expand the protection and the appropriate services to persons with diverse abilities, such as the Teleton project which has established different Child Rehabilitation Centers across Mexico for children with disabilities. More recently, the Mexican Government conducted a National Survey on Disabilities (ENADIS) in order to assess the state of the protection of the population with diverse abilities and to guide the implementation of policies in this area. 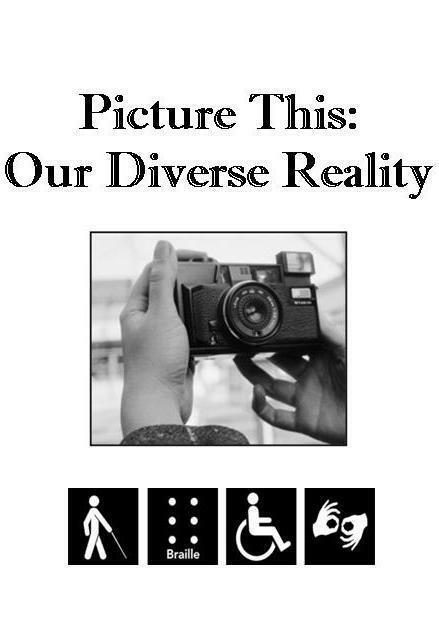 For all those reasons, the Mexican Embassy welcomed the exhibition “Picture This: Our Diverse Reality” in order to contribute to the efforts in Belize towards the strengthening of the protection of persons with diverse abilities. The exhibition will remain open until February 10th, 2012. The entrance is free and open to the general public, Monday to Friday, from 8:30 am to 5 pm.